A Russian tourist staying in a hotel 200 metres from a private beach where gunmen opened fire killing several tourists has described the 'shocking' scenes he witnessed in the immediate aftermath of the attack. 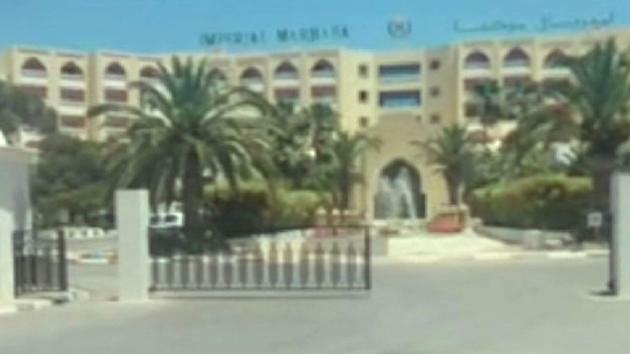 Petr, a holidaymaker from Moscow, told Yahoo News UK he saw three dead bodies face down on a beach area popular with British tourists in the resort of Sousse, Tunisia. Seeing the commotion from his hotel bedroom window immediately after the attack Petr rushed outside and followed hotel security men. He said: "I just saw that there was something wrong and security were rushing to the beach, so I followed. "I saw two women and one old man and they all appeared to be dead." Petr , who did not want to give his surname, took a picture of the scene, showing a man on the beach wearing blue shorts lying face down in the sand with what looks like blood in the area around his head. Empty sun loungers can be seen behind him and there does not appear to be anyone else near him. Petr said he was told by witnesses that a group of terrorists approached the shore on a boat and opened fire while still onboard. "They shot the first line of people on the beach and then turned the boat and left." Sousse is a city on the east coast of Tunisia, about 87 miles (140km) south of the capital, Tunis. Around 1.2 million tourists visit Sousse every year, drawn by the hotels, sandy beaches and culture.